An international team of astronomers today announced the discovery of a nebula in a nearby dwarf galaxy that they identify as a globular cluster being formed -- the first observation of an intense stellar nursery in the early stages of producing hundreds of thousands of stars. "We frequently see stars in formation, but this is the first time we have identified the early formation of a super star cluster on its way to becoming a globular cluster," said Jean L. Turner, professor in the Department of Physics and Astronomy at UCLA, and principal investigator of the research. "This is the youngest known globular cluster yet identified; we are seeing this cluster at a point in its development that, in all other examples in our Milky Way galaxy, occurred billions of years ago." The findings were reported today at the meeting of the American Astronomical Society in Atlanta. Along with UCLA's Turner, the research team includes Sara C. Beck of Tel Aviv University, Varoujan Gorjian of JPL/NRC, and Paul Ho of the Harvard-Smithsonian Center for Astrophysics. The globular cluster -- a spherical grouping of hundreds of thousands of stars -- was found in NGC 5253, a dwarf galaxy, about twelve million light years from Earth in the direction of the constellation Centaurus. Globular clusters, with their extreme concentrations of stars in various stages of development, have long puzzled astronomers. These spectacularly large and beautiful star clusters are common within our Milky Way galaxy, where they are favorite targets for amateur and professional astronomers. However in the Milky Way, the globular clusters are always at least several billion years old, and many date to the earliest period of the universe's existence. 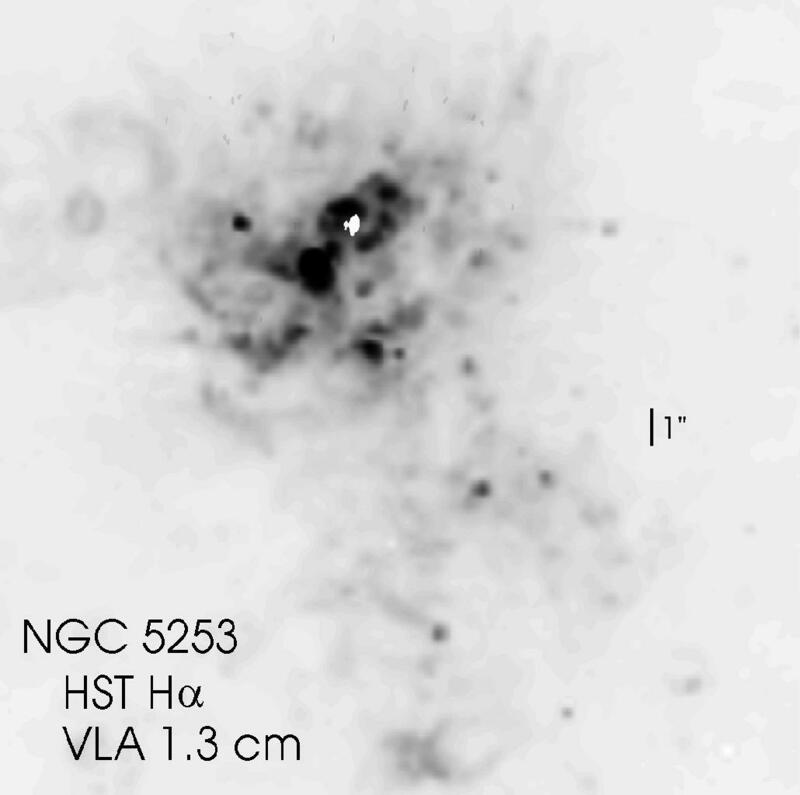 The newly-identified cluster in NGC 5253 is estimated to be less than one million years old -- so young in astronomical terms that it cannot be viewed optically because it is still enveloped in the gas and dust cloud from which it formed. The astronomers were able to identify the cluster only through radio and infrared data. The discovery, along with results of other recent research, disproves older theories that held that globular clusters only formed billions of years ago. However, the new research also deepens the mystery of why such clusters are no longer forming in the Milky Way. "When we see young stars in our galaxy, they may be forming in small groups of ten or up to a thousand stars stars, but nothing like the hundreds of thousands of stars in a typical globular cluster," said Gorjian. "Conventional wisdom long held that globular clusters could form only in the extreme conditions of the early universe; where are the young globular clusters in the Milky Way, and why isn't our galaxy making them anymore?" Said Turner, "It is now becoming clear that these extremely large clusters are forming right now in other galaxies. This is the largest cluster ever seen at such an early stage of evolution." The team conducted its studies with radio images with the National Science Foundation's Very Large Array in Socorro, NM, and infrared images with the new Long Wavelength Spectrometer of the Keck Observatory on Mauna Kea, Hawaii. The radio data suggested and the infrared confirmed that the nebular surrounding the globular cluster in NGC 5253 consists of glowing gases heated by a dense cluster of about 100,000 very young stars in a region between 3-6 light years in diameter. Recent Hubble Space Telescope images of nearby galaxies have revealed large young clusters called "super star clusters" which are the likely precursors to globular clusters. "Since optical light is seen from these super star clusters, they must have emerged from the dust clouds they formed in and are thus older than the cluster we identified in our radio and infrared images," said Beck. "However, they are much younger than the globular clusters in the Milky Way. "Further studies of the gas cloud from which the globular cluster in NGC 5253 is forming and conditions within the galaxy itself may provide clues that explain why star formation is different in these systems, and help us understand the star formation history of our own and other galaxies," said Beck. This research is supported in part by the National Science Foundation, the US-Israel Binational Science Foundation, the National Research Council, and the Smithsonian Institution. The Keck Observatory is operated jointly by the University of California and the California Institute of Technology, with support from NASA.